A chilling tale of how Petro Poroshenko's proxies fattened already exorbitantly priced low-quality smuggled spares. “It serves no purpose for Ukraine to fight for its body in Donbass just to lose its soul to corruption”. That was former US Secretary of State Rex Tillerson’s statement two years ago demanding support for the National Anti Corruption Bureau (NABU), established in 2015. But his warning words acquired a new value after the publication of exposés in February 2019. Journalists maintained that corruption was plaguing the army. The NABU, amongst others, took bribes in return for ignoring the fraud in the defense industry. 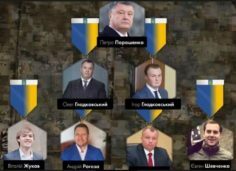 As revealed by the latest investigation, published by Bihus.info on March 12, the NABU, and contrary to Washington’s expressed hopes, not only was illicit deals fascilitated, affecting “the soul of Ukraine”, but Ukraine’s capacity to “fight for its body in Donbass” was undermined. Ukrainians have become used to corrupt politics. But this exposé by Bihus.info on the fraud and embezzlement within the Military Industrial Complex (MIC) however, was particularly explosive due to the behavior of those at the top. 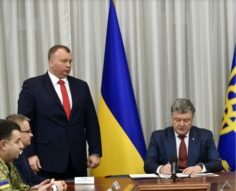 Reports included documents, correspondence, phone conversations, etc, as well as proof of the purchase by Ukroboronprom (a Ukrainian defense industry state company) of military spares smuggled from Russia, only be sold to state companies at inflated prices after being bought from third parties. This happened against a backdrop of incessant propaganda about “the non-stop fight against Russian aggression”. Moreover, the contraband was never tested, and the military was often sold outright junk. Ukrainian military enterprises often purchase stolen goods: spares that had previously been acquired from Ukrainian military units which are sold back to them. 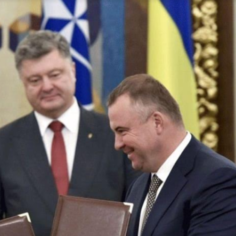 These shady deals were possible due to Poroshenko’s close friend and business partner Oleh Gladkovskyi, whom Poroshenko appointed as first Deputy Secretary of the National Security and Defense Council (SNBO) in February of 2015. Gladkovskyi also headed the Interdepartmental Commission for the MIC. Before the scandal, Oleh Gladkovskyi was known to the Ukrainian media as Poroshenko’s proxy in charge of military industry. Using this position, Gladkovskyi created fraudulent deals and government contracts between Ukrainian military enterprises and shell companies, all managed by his son Ihor Gladkovskyi along with his partners – Vitaliy Zhukov and Andriy Rohoza – involving companies that either produced or repaired military equipment. 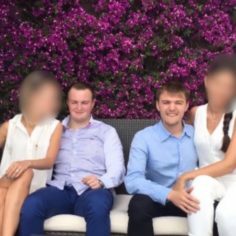 Zhukov, employed by Ukroboronprom until 2014, managed the paperwork and kickbacks, whilst Rohoza was engaged as the “smuggler”, having had previous experience in profiteering from military contracts. The team was picked by Gladkovskyi junior in 2015, after his father was appointed Deputy Secretary of the SNBO. Ihor Gladkovskyi, then just 22, immediately busied the team with the supply of smuggled and used Russian spares for the military. Rohoza and Zhukov sold goods via front companies to their own intermediary Optimumspetsdetal (Optima). Gladkovskyi junior and Zhukov living the high life. 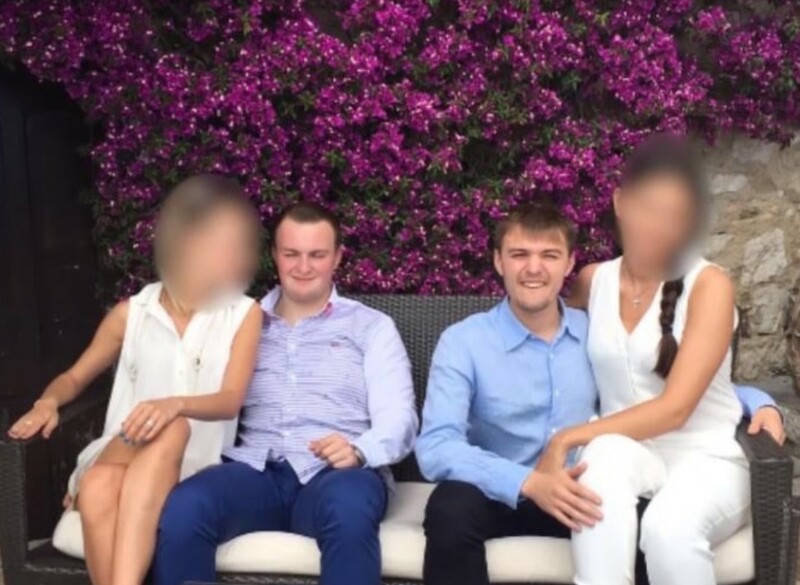 Later, Gladkovskyi junior entered the scene, arranging meetings with help from his father between partners and directors of the MIC, as well as the Ukroboronprom company. The directors then agreed to purchases at between 200-700 percent above the market rate, in return for payments. Once delivered, this kit was found to be either broken, in need of repair, or not equipment that the plant could repair. This did not however prevent further deals, as saying “no” to dealers with highly placed connections was impossible. Incidentally, Zhukov, in a remark from his message to Gladkovskyi junior called these managers “an absolute horde that need to be torn as new assholes and told exactly what to do”. 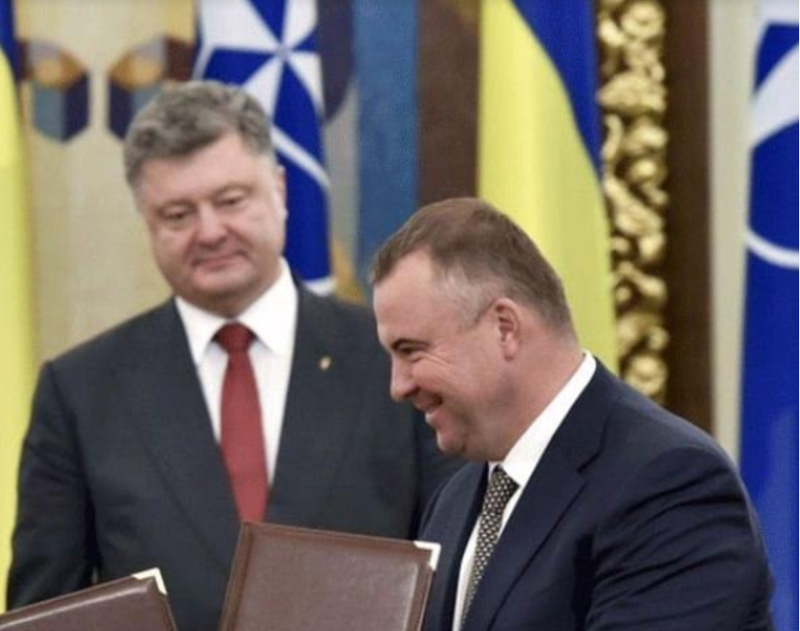 However, Zhukov was friends with one of the directors, Pavel Bukin, who Poroshenko appointed as Head of Ukroboronprom in 2018, and previously headed one of the key branches of the state concern – Ukrspetsexport (USE). In 2016, Bukin suggested purchasing altimeters for AN-26 aircraft in Russia. “We’ve got money, so, let’s go spend”, wrote the head of USE to Zhukov, and requested clarification regarding markups in order to syphon off all the funds (14 mln UAH ≈ €468k) allotted for the contract. In less than a week USE transferred a large advance payment (80 percent of the sum) to Optima’s account. According to Zhukov’s correspondence with Gladkovskyi junior and Bukin, this was cashed in and shared before the goods were even delivered, and the payback to Gladkovskyi senior alone constituted $30k, and to Bukin, $10k. As well as the front company Optima, the three, Gladkovskyi, Rihoza and Zhukov even used Poroshenko’s own plant Kuznia na Rybalskomu as an intermediary to pocket tens of millions of Hryvnia. They were so comfortable dealing with the President’s plant that they used the plant’s operating assets for purchases. 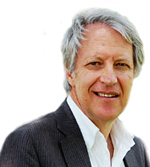 Anatoliy Shariy, a known media expert, also noted these deals. He unearthed and published evidence regarding the embezzlement of funds. 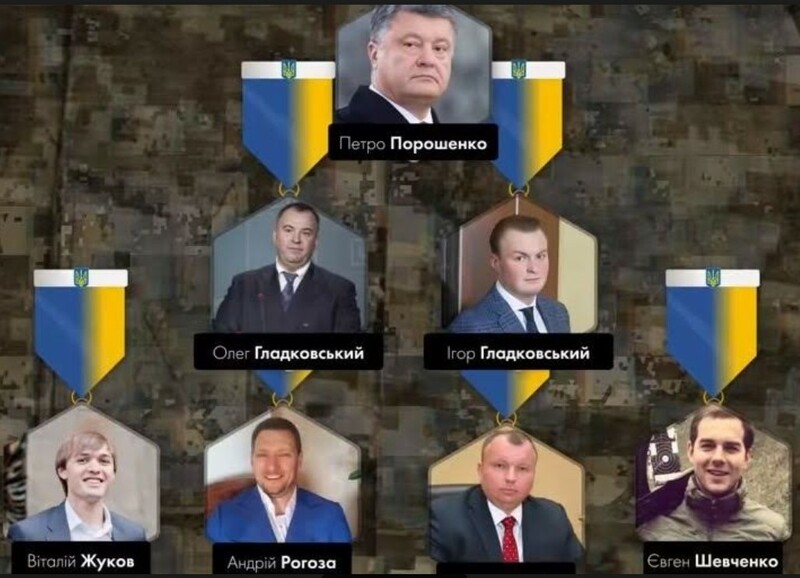 According to one contract he published, the Kiev Armored Vehicles Plant, a branch of Ukroboronprom, bought parts from Kuznia na Rybalskomu for 25 mln UAH (≈ €828k), even though the plant does not produce these parts, but they were bought at prices 2-2,5 times above market value. The problem was that when tested by the Kiev Amored Vehicle Plant after purchase, they did not meet quality standards and could not be used for production: the manufacturer’s stamps were missing and some parts were already used. Shariy suggested that used spares were stolen from army units through either write-offs or looting, and he was proven right by the Bihus.info investigation. Parts taken from vehicles or stolen from stores, were illegally sold to Hladkovskiy’s group by ministry officials. However, even more bizarre things have since come to light. Optima sold tank rangefinders to the Kharkov armored vehicles plant for the sum of 13 mln UAH (≈ €431k), and those very rangefinders had been stolen from that same plant! The pricing of the products was also strange: one example was Zhukov’s correspondence with his subordinates. He told those who came up with a commercial offer to one of the plants in January of 2017: “On the table, where our prices are multiplied by 2, multiply them again by 2,5”. Gladkovskyi’s group, immune to prosecution, made no effort to hide their shady deals. This attracted the attention of the security services and the Ukrainian anti-fraud body. Nevertheless, in spite of the charges brought, at the beginning of 2016 by the Security Service (SBU) and Military Prosecutor’s Office and Tax Agency, nothing came of the investigation. 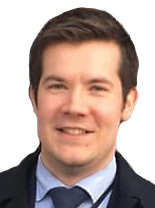 State bodies did nothing due to the fraudsters’ connections and as a result of bribes. The correspondence between Zhukov and Rohoza revealed interesting details nevertheless. The investigator of Kiev’s SBU, Dmitriy Moskalenko dealt with the Optima company case. He took payments (and luxury cars) in return for the charges being dropped. Even as early as 2015, the Military Prosecutor’s Office had filed cases against Optima and other allied companies related to Gladkovskyi’s group. The correspondence shows that millions were spent from the country’s budget to dismiss these charges. A once-off bribe to the Tax Agency amounted to $8k. The relationship between the dealers and the NABU developed in a curious way. The NABU was created as an impartial body, independent of the government and ostensibly to fight corruption even when other state agencies failed. In 2016 NABU filed its own case against Optima, listing the company as suspicious due to obvious signs of illicit activity. This threatened contracts related to the Ukroboronprom concern. Businessman Yevhen Shevchenko, a freelance Bureau agent, was employed as mediator in order to solve the NABU problem. Soon after, NABU’s in-house detective Dmytro Lytvynenko, whom Rohoza had contacted via Shevchenko, personally clarified the issue with Rohoza, meaning that the company should be taken off the list. In January of 2017 the Ukroboronprom concern received a letter signed by Deputy Director Gizo Uglava, stating that Optima had been removed from the list, therefore allowing the deals to continue. Incidentally, Shevchenko in his interview to Bihus.info confirmed the authenticity of the correspondence records, as well as his acquaintance with Rohoza and his partners. He was able to earn up to $300k on supplies to defense industries. 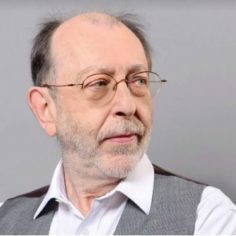 Analyzing everything published by Bihus.info, we conclude that state bodies had known about fraudulent deals down to the last detail for nearly three years, but despite that, before the publication caused this scandal, the journalists’ investigation of the case was blocked. After the investigation was first published in February, officials refuted it and said it was “manipulating the electoral campaign”, against Poroshenko. The next part of the investigation however forced the government and law enforcement bodies to close the issue urgently. The SBU, the General Prosecutor’s Office and other agencies implied that the proceedings were followed and that a conclusion was close. Public outcry on social media forced Poroshenko to sack his crony Oleh Gladkovskyi as Deputy Secretary of the Security and Defense Council and announce an audit of Ukroboronprom. The General Prosecutor’s Office said it filed 25 cases regarding corrupt practices in the MIC, and NABU president Artem Sytnyk told the press about investigations regarding ten enterprises in conjunction with Ukroboronprom, which resulted in the embezzlement of about one billion Hryvnya (≈ €32,8 mln) from the state budget. However, one question remains unanswered: How could shady deals, in which the Kuznia na Rybalskomu plant, belonging to the President, be possible without Poroshenko’s blessing? Moreover, if the investigation was underway, why did the President promote the corrupt official Bukin, having appointed him as head of Ukroboronprom? Another question arises as well: why did previous media exposures of Oleh Gladkovskyi’s corrupt activities go ignored and only come to light a month before the Presidential elections? A year ago The New York Times wrote about the purchase of 50 old military ambulances from Gladkovskyi’s company, half of which broke down upon delivery, but despite that, the Ministry of Defense ordered 100 more identical vehicles. So much for Poroshenko’s offer in October of 2017 “to cut off the hands of those, who will steal from the army”. But in 2014 he promised that “the Anti-terrorist Operation cannot and will not last 2 or 3 months, it should and will last hours”. Nevertheless, the war proved to be a very profitable business, and, as the saying goes, time is money. Incidentally, regarding money, it has only been in the two last months that the President made a fiscal declaration for the electoral candidacy. His income was 856,5 mln UAH (€28,5m), and his income in 2018 was 123,6 mln UAH. Certainly, 2014 was more profitable with the President having declared 369 mln UAH, but with the war, hostilities only facilitated shady deals with the defense industry. However, we should be careful with these figures because, as the publication of the Panama Papers showed, Poroshenko transfers some funds offshore. It is no coincidence that Gladkovskyi, Poroshenko’s old friend, diverts the money into offshore accounts in the Seychelles. This was why Gladkovskyi became honored consul to the Seychelles, a post later given to his son Ihor. 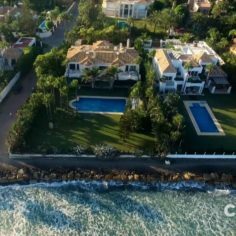 That Poroshenko and Gladkovskyi (as well as Ihor Kononenko, another Poroshenko crony and leader of the President’s parliamentary faction) have luxury villas in the same district in Spain is no accident. 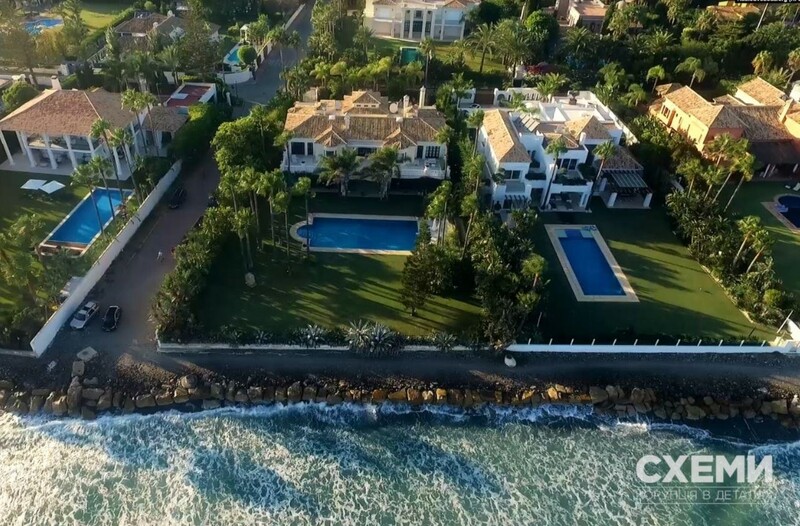 Incidentally, Poroshenko’s €4m villa has not been declared as an asset. At the same time, Ukrainian citizens, according to polls conducted by the Kiev International Institute of Sociology (KMIS) in 2018, considered the key problems of state to be the war in Donbass (66 percent) and state corruption (43 percent). Moreover, 78 percent of Ukrainians think that the country is moving in the wrong direction. Whilst Poroshenko’s income and the profits of his inner circle grew in 2018, the financial state of 60 percent of the citizens worsened (according to the data of Rating sociological group). Perhaps, this explains the level of distrust towards the President – 69 percent, while his trust rating is identical to that of Viktor Yanukovich just before he was ousted – 17 percent (“Rating”, March of 2019). It is obvious that Poroshenko’s mantra that he has repeated so many times, that “we’ve said the final good bye to the Russian Empire and the Soviet Union” – is completely at odds with the daily realities facing the Ukrainian people, who have grown tired of their serving president that they are ready to say their “final goodbye” to him at the elections on March 31. That is unless that same nefarious malaise does not infect the very electoral system of Ukraine, of course. Well, the Ukrainians can thank the Americans and Israelis for the condition of their country. They are now a western ‘democracy’. If justice was served then Poroshenko and his cronies would be hanging from lamp posts, but I wouldn’t hold my breath waiting for that to happen.